Sigmax Security Inc., today officially added e-Map, a new function to its NER and HDER systems that offers a map view of camera locations and coverage based on either floorplan(for indoor cameras) or satellite view(for outdoor cameras). When the map mode is switched on, end users are allowed to access live video of indivisual camera of interest by simply moving mouse cursor over a camera icon. 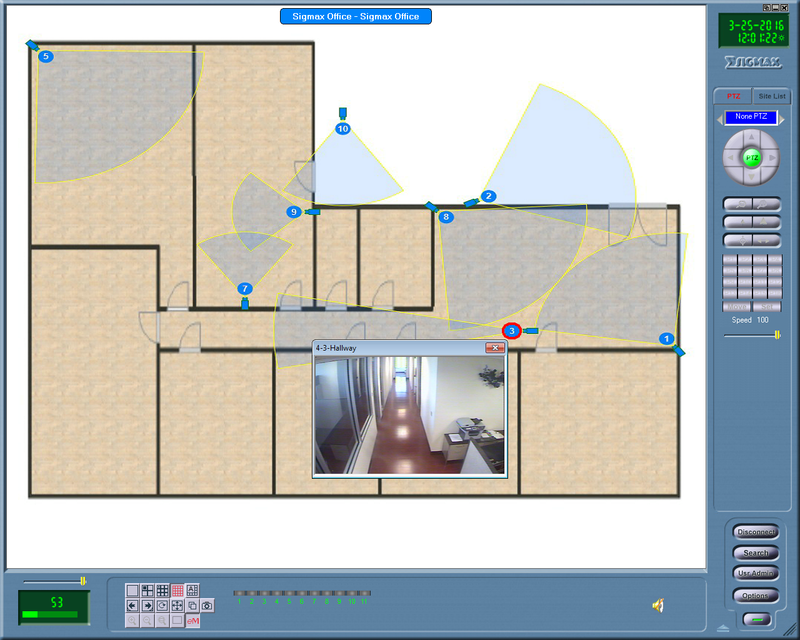 Multiple maps can be created for a single system to include both indoor and outdoor cameras. The e-Map will be included in all new systems starting today. Existing HDER/NER users will be able to use this function once system is updated to the latest version. Sigmax Security Inc., has released a new system update for its NER and HDER systems that offers ONVIF compliance. This critical update expands Sigmax's IP camera support list to vitually cover all IP video products of the world's major manufacturers who comply with the ONVIF specification. ONVIF is an open industry forum for the development of a global standard for the interface of IP-based physical security products. The ONVIF specification ensures interoperability between these products regardless of brand. For more information about ONVIF, please visit www.onvif.org. 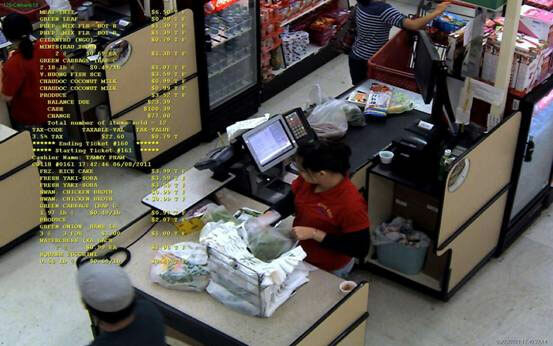 Sigmax's IP-based POS Interface w/ Transaction Overlay adds eyes to loss prevention effort of retail owners. Sigmax Security is delicated to offering retail owners the best tool to produce undeniable evidence to catch dishonest employees and help save business costs by reducing inventory shrinkage and cash loss. If POS system supports UDP protocol, then the POS Transaction Interface to the NVR is easy by using a single network patch cable rather than the traditional way of running wire to each POS terminal using serial port devices using data capture box. This feature saves you a lot of money on material and installation cost. Three 4 x IP camera turn-key solutions are also available at affordable prices to help small business owners enhance security. A 30-day free trial version of NVR software can be downloaded Here. Support videos can be found Here. Sigmax Security has just added Onix System and Brickcom's Megapixel IP cameras to its support list. Now Sigmax's HDER/NER Servers support 20 major manufacturers's cameras including: ACTi; Arecont Vision; Axis Communications; Basler Vision; Brickcom; Dynacolor; Etrovision; IQinVision; JVC; LiLin; Messoa; Onix; Panasonic; Pelco; Samsung; Sony; StarDot; Toshiba; Vivotek; Yokotech. Sigmax Security has just released a new version of its server software that allows creation of easy-to-remember hostnames for remote access. This feature is especially useful for users who have dynamic IP addresses from their ISPs. With a choosen hostname, users are freed from memorizing long-digit IP address (static or dynamic) for connection to the server. Instead, they can always use the same(static) hostname that is of users' preference when created. Here is How to set up a static hostname on HDER/NER. Sigmax Security has just added Messoa and Yokotech's Megapixel IP cameras to its support list. Now Sigmax's HDER/NER Servers support 18 major manufacturers's cameras including: ACTi; Arecont Vision; Axis Communications; Basler Vision; Dynacolor; Etrovision; IQinVision; JVC; LiLin; Messoa; Panasonic; Pelco; Samsung; Sony; StarDot; Toshiba; Vivotek; Yokotech. Sigmax Security has just added Basler vision's Megapixel IP cameras to its support list. The 15 major manufacturers include: ACTi; Arecont Vision; Axis Communications; Basler Vision; Dynacolor; Etrovision; IQinVision; JVC; LiLin; Panasonic; Pelco; Samsung; Sony; Toshiba; Vivotek. Sigmax Security will keep on expanding its support list for higher compatibility. Basler vision with nearly two decades of machine vision experience designs and manufactures high quality digital cameras for industrial users. The company was founded in Lübeck, Germany in 1988. Sigmax Security's hybrid video servers now offer options of integrating megapixel cameras via network. A wide range of network-based megapixel cameras are supported, including models from Panasonic®, ACTi®, Arecont® and many others. Higher resolutions of megapixel cameras greatly enhance Sigmax DVR's capability of capturing picture details for critical security applications such as license plate capturing and facial recognition. Sigmax Security Inc. is pleased to announce the completion of their DSX Access Control integration project .This integration feature will allow the Sigmax DVR to stream video via IP, from their server onto the WinDSX software's graphical user interface upon demand in a "pop-up" window based on programmed alarm events using the WinDSX Input to Output linking capability. Sigmax Security Inc., manufacturer of the Digital Event Recorder (DER) & the industry leading Point of Sale Event Monitoring (POS-EM) Software will be exhibiting their Digital Video Recorder and POS Interface at the Convenience Store Trade Show in Tacoma, Washington on February 6th & 7th at Booth #408. Sigmax Security Inc., manufacturer of the Digital Event Recorder (DER) & Point of Sale Event Monitoring (POS-EM) Software will be exhibiting their Digital Video Recorder and POS Interface at the 21st Annual Texas Burglar & Fire Alarm Association Convention in Galveston Texas at the Tremont House Hotel on 2300 Ship's Mechanic Row. Sigmax's systems will be presented at Booth #19. Sigmax is an Associate member of the Houston Gulf Coast Alarm Association. Sigmax Security, manufacturer of PC Based Digital Video Recorders, with an industry leading Point Of Sale interface, is now offering the option of direct Server based POS interface of Sigmax DVRs with NCR ScanMaster®, Micros® and StoreNext® POS systems. This configuration will allow for a trouble-free installation and for the end user to avoid the cost of cabling normally used when each POS terminal is linked to the video server. Additionally, the real time POS text overlay and exception reports synchronized with video is maintained on this platform. Sigmax Security, manufacturer of PC Based Digital Event Recorders, has enhanced its powerful Server software with an exceptional new feature. Sigmax DER systems support dual monitor display. 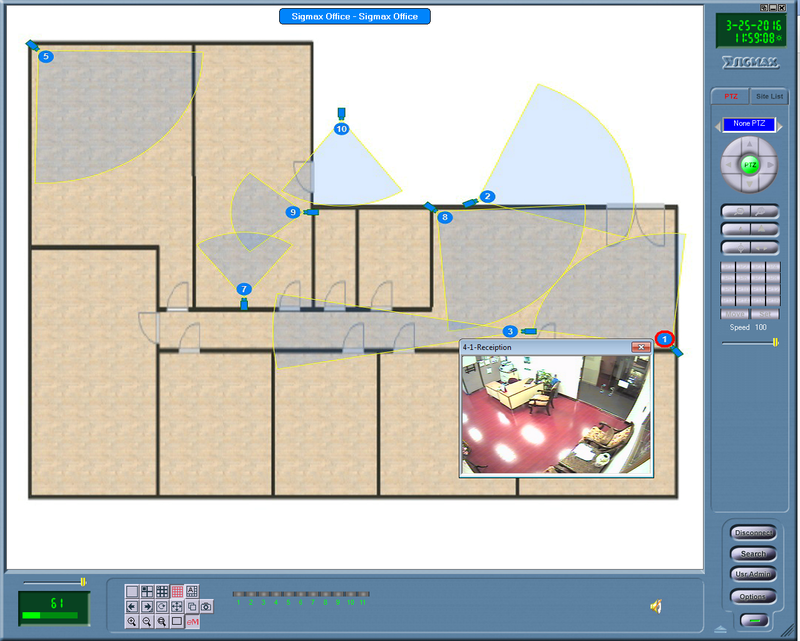 Users can see live monitoring on one monitor while playing instant review or archived on the second monitor, all at the same time. This is done by dragging instant review window or video playback window to the secondary monitor. The second monitor can also be set up for spot or split screen configuration allowing for a separate live monitor which could then be placed in public space if required. Sigmax Security Inc., manufacturer of the Digital Event Recorder (DER) & Point of Sale Event Monitoring (POS-EM) Software will be exhibiting their Digital Event Recorders at the Retail Industry Leaders Association Exposition at the Hilton Anatole on 2201 Stemmons Freeway, Dallas, TX.